ISLAMABAD: Panelists at a book launch ceremony here lamented that the political discourse coming from the country’s mainstream as well social media was polluting the young minds by promoting a culture of intolerance, rigidity and abuse. A large number of people from various segments of the society attended the gathering. 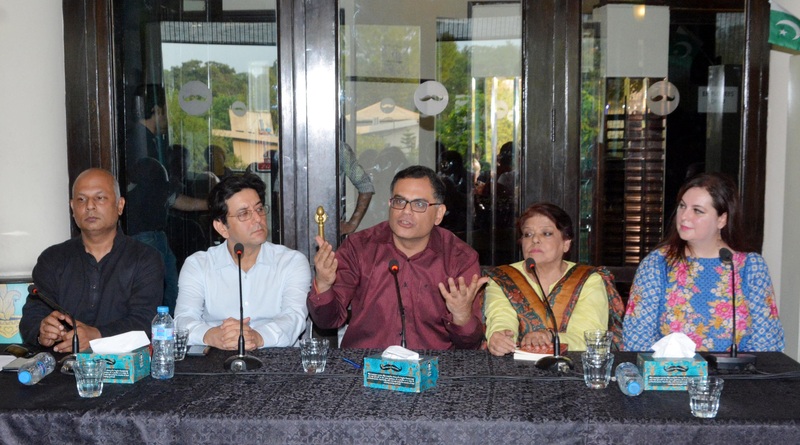 Renowned journalist Haris Khalique, human rights defender Kishwar Naheed and activist Ali Dayan Hasan shared the panel with Raza Rumi and threw light on various aspects of the book. The book is based on research work of the author in his surroundings and traveling experiences in different areas of the country aimed at identifying the facets of civilization, cultures and arts that once set country’s political and social discourse. The book is a riveting account of artistic traditions and their significance in today’s Pakistan, presenting an alternate view of the country beyond the usually painted picture of the political instability and terrorism. Commenting on media, the author said that until the recent past, there were programmes on culture, music and arts on our state TV channel. However, now no TV channel airs such stuff. “Mainstream and social media discusses political landscape 24/7. Nobody explores cultural or social landscape, which is disastrous not only for the country but for the youth also,” he added. Praising the book, Haris Khalique said that the author has beautifully challenged the prevalent discourse of the country. “This book is based on deep observation and research on South Asia in which a global citizen has identified the real roots of our society. The book is an appreciable and valuable piece of work,” he said. Former Human Rights Watch director Ali Dayan Hassan said that Raza Rumi left the country in unfortunate circumstances four years ago “but we are lucky that an asset like him is back among us.” He said that the literary and cultural commentaries by the author were valuable for the society which is overburdened by political and divisive discourses. He said that the book shares about South Asia identity and was also a reflection of author’s own journey. Poet Kishwar Naheed shared the past memories with the author’s family. “When your past is good, it becomes a source of pride… but when it’s painful and full of oppressions and suppressions, it makes you cry… and we have a painful past, at least the recent one,” she said while wxpressing her views. She said that the author’s account of the civilization and the cultural history was really an appreciable effort. “The book is a mirror for all of us who are living in a house that has cracks in its walls and the roof… and we need to save our house from total collapse,” said Ammar Masood, a renowned journalist and columnist. During the question-answer session, Rumi said that he was optimistic and hopeful about a good future of the country due to various changes in the recent past. “The peaceful transitions of power and continuity of democracy; young Pakistanis getting access to education and increased participation of women in various sectors will definitely help ensure a prosperous future for Pakistan,” he said, adding that growth of film, arts, music industry and cinema were also very positive signs. To another question about race for ratings by the electronic media in Pakistan, Rumi said that the media has turned into a business industry as several cooking oil and soap factory owners were running their own TV channels now. “This mad race for ratings is, in fact, dangerous for the society and a big challenge for us to counter.” Pakistan desperately needs an independent media outlets that can bring back public interest in journalism, he added.